DVD Synopsis: A perfect romantic getaway turns into a hellish nightmare in this suspense-filled thriller! Architect Scott Campbell (Ronald Foster) and his wife Nancy (Merry Anders) join another couple, Joseph and Loy Schiller (Richard Crane and Erika Peters), for what promises to be a pleasant stay at an empty castle set on a seculded California hillside. Soon, however, tension mounts as terrifying things begin happening. I have a soft spot for black and white ‘haunted house’ films, so I was really excited when I first sat down to watch House of the Damned. 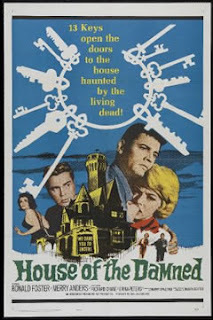 But the film establishes pretty early on that the house of the title is haunted not by a ghostly presence, but beings of flesh and blood, which kinda took the edge off for me. With ghosts, it’s impossible to predict what’s going to happen. Will the house shake? Will the walls bleed? Will chains rattle in the hallway? There’s no way of knowing, and that’s what ultimately builds tension. The unwanted guests in House of the Damned, who are 100% mortal, seem limited to stealing keys and locking doors. I’m not saying there aren’t a few thrills to be found in House of the Damned (there’s one excellent scene in which we see the silhouette of a strange being with no legs walking on its hands across the floor); they’re just not as thrilling as they could have been.